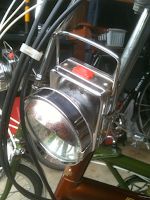 I have been doing some fun, smaller projects on the Raleigh Twenties. Check out the pics below! Here are the Twenties... Now with shellacked cork hand grips, matching front headlights, brass Crane hammer strike bells and some vintage rubber pedals for the brown one. First the pedals... These came from England and were taken from a vintage Raleigh of unknown type. There is quite a bit of "patina" (read rust pitting) all over them and the tread is nearly gone in spots. After I won the bid on eBay, I was a little regretful actually, but they add to the vintage look and they work fine. They were just a little expensive for what they are. I got them for 90 pence but the shipping was nine pounds sterling. Oh well, they are original. I actually found another headlight to match the one that came with the green Twenty. It is identical in all ways and lit right up when I got some fresh batteries in it. 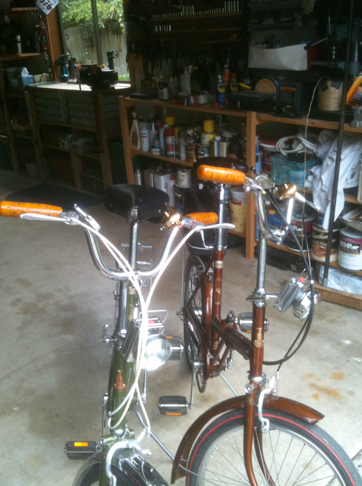 This one is in rougher shape than the one on the green bike. There is quite a bit of rust on the eyeshade and a few rust spots on the body. I was going to try and paint it in a silver paint color, but it looked silly. Keeping it retro looking with all its rustiness intact. THESE are the big deal. 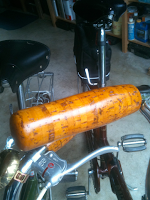 I had been recently coveting the beautiful bar grips that the fine people at Lovely Bicycle blog had been putting on their vintage bikes. 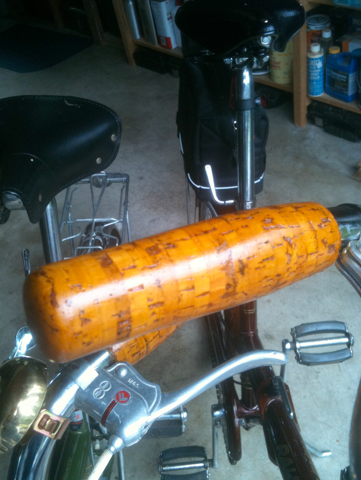 I found the cork grips at Rivendell Cycle. They are the Portuguese cork handles that use real cork cut from the tree. They are really pretty with the grain intact. Three coats of Zinsser Shellac later and they become this gorgeous honey color, smooth yet compressible. They feel really nice in the hand. I know they are not "vintage stock" but they look great!! So what else can I do to these beauties?? 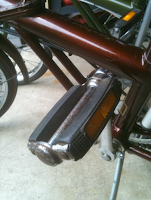 I'm still missing a small round rear reflector for the brown one. I'm thinking of taking a trip to Recycled Cycles soon to see if I can find one. The big job left for the green one (which is my wife's bike) is to get another B-66 saddle and a black Challenge saddle bag. Other than the color and the fenders, they'd be a complete matching set.